The automation of garage doors has added a lot of convenience and security to the lives of countless homeowners. Unfortunately, the opener, which is the device that controls and powers the movement of these automated systems, can malfunction from time to time. It's the nature of every hardworking electro-mechanical system to experience some issues here and there, but when there's such a complex and potentially dangerous system involved, every problem could drag a lot of inconvenience and danger along with it. Luckily for you, our team specializes in dealing with these complex devices, and we can repair or replace any of the unit's different parts. 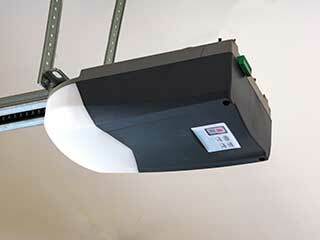 The problems that may affect your garage door opener aren't just mechanical in nature. Sure, its motor gear could wear out or broke, and some part of the drive system could get damaged over time or due to an accidental collision, but the electrical components can also experience some issues. The circuit board can glitch, and the photo eye sensors can fail or become misaligned, which may cause your door to start reversing for seemingly no reason. Our team can carry out the opener troubleshooting efforts until they discover what's causing the problem. Then we'll either fix it or replace the affected component and make sure that your motor unit returns to its optimal status. If you decide it's time to improve the security and safety of your home, then getting a new garage door opener is a great way to do that. There are three different types of drive systems that are commonly used today. If we had to compare some of their aspects, it would be easy to see the main distinct characteristic that each drive system presents. A chain drive unit will be the lowest costing of the three, but also the noisiest one. A belt drive opener will be the quieter by far, but also the most expensive one. A screw drive model, otherwise known as a direct drive, will be the fastest, but it may be affected by temperature shifts, and it won't be very quiet either. Before you decide on which one to get, there are all sorts of addition things that need to be taken into account, like horsepower output, additional features and so on. Our team will advise you on the different aspects and help you make an informed decision that you will not regret. Whether you're in need of emergency repairs or looking for a new automatic opener, our experts are at your service. Contact Garage Door Repair Denton today for more information.